Editor’s note: This is a hoot, borrowing some of Trump’s own outrageous language for a review of his signature restaurant. “Halfway through a recent late lunch at the Trump Grill—the clubby steakhouse in the lobby of Trump Tower that has recently become famous through the incessant media coverage of its namesake landlord, and the many dignitaries traipsing through its marbled hall to kiss his ring—I sensed the initial symptoms of a Trump overdose. Thanks to an unprecedented influx of diners, we were sitting at a wobbly overflow table outside the restaurant, in the middle of a crush of tourists, some of whom were proposing to their partners, or waiting to buy Trump-branded merchandise, or sprinting to the bathroom. “As my companions and I contemplated the most painless way to eat our flaccid, gray Szechuan dumplings with their flaccid, gray innards, as a campy version of ‘Jingle Bells’ jackhammered in the background, a giant gold box tied with red ribbon toppled onto us. Trump, it seemed, was already fighting against the War on Christmas. “Donald Trump is ‘a poor person’s idea of a rich person,’ Fran Lebowitz recently observed at The Vanity Fair New Establishment Summit. ‘They see him. They think, ‘If I were rich, I’d have a fabulous tie like that.’ Nowhere, perhaps, does this reflection appear more accurate than at Trump Grill (which is occasionally spelled Grille on various pieces of signage). On one level, the Grill (or Grille), suggests the heights of plutocratic splendor—a steakhouse built into the basement of one’s own skyscraper. “On another level, Trump Grill falls somewhat short of that lofty goal. 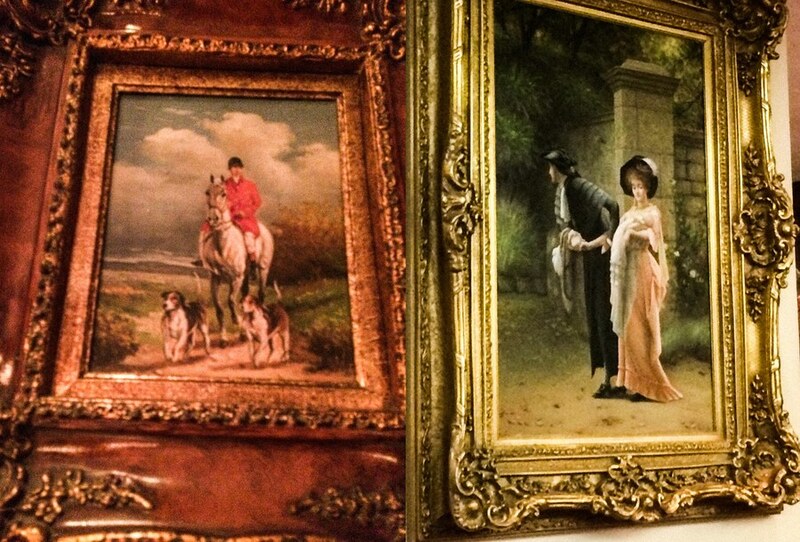 The restaurant features a stingy number of French-ish paintings that look as though they were bought from Home Goods. Wall-sized mirrors serve to make the place look much bigger than it actually is. The bathrooms transport diners to the experience of desperately searching for toilet paper at a Venezuelan grocery store. And like all exclusive bastions of haute cuisine, there is a sandwich board in front advertising two great prix fixe deals. “The allure of Trump’s restaurant, like the candidate, is that it seems like a cheap version of rich. The inconsistent menus—literally, my menu was missing dishes that I found on my dining partners’—were chock-full of steakhouse classics doused with unnecessarily high-end ingredients. The dumplings, for instance, come with soy sauce topped with truffle oil, and the crostini is served with both hummus and ricotta, two exotic ingredients that should still never be combined. The menu itself would like to impress diners with how important it is, randomly capitalizing fancy words like “Prosciutto” and “Julienned” (and, strangely, ”House Salad”). Yes, the two have been going at it since the ’80s; this food fight is just the latest. Think I’ll watch the new season of The Man in The High Tower this weekend to get ready for Trumpland! Next Next post: What’s former Sierra College Trustee Aaron Klein up to now?